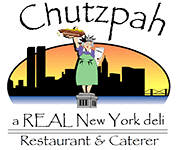 Among the restaurants that cater in Northern Virginia is Chutzpah, a great eatery that serves authentic New York food that you and your guests will enjoy. Chutzpah deals in a wide range of clientele and caters to all sorts of events – whether it’s a private dinner for colleagues, Shiva, brit shalom, or even a brunch with the extended family. Food brings people together for good and creates bonds that last a lifetime. For Chutzpah to provide the ideal experience and to live up to its name, it has to use the freshest ingredients – sourced locally – and also have witty staff to meet New York standards. The restaurant is large enough to accommodate large groups if you prefer to walk in for your meals, and at the same time, the take-out menu is extensive. What makes Chutzpah a preferred eatery when there are so many of them in the Fairfax area? Apart from the delightful staff and unbeatable ambience, the fresh food stands out from the frozen options typically available in the city. The central location works well for those walking in and the online ordering system is in line with the times. Delivery, timely and efficient, has also been a bonus. Catering to any event in Northern Virginia requires that all parties involved work together seamlessly, which is why we alter our menu slightly to accommodate your preference. We have incorporated several things that New Yorkers and Northern Virgina folks love, but we are flexible enough to include more of what we may have missed that your guests would love. We recommend that you place your order before 3PM on the day before delivery to give us enough time to meet all your needs. Our flexible cancellation policy requires that you cancel your order hours before delivery to avoid a 25% penalty. When you work with Chutzpah Deli to cater to your party, these are some of the things you get. We believe our extensive menu caters to all palates, but we are flexible enough to change a few things for your event. We work with you every step of the way to ensure that every meal served during that event is as you would have wanted. Just take a look at our menu and the prizes of our platters to see what we mean. Our generous portions are accompanied by an unbeatable price so that you can feed a gathering without breaking the bank. We have overstuffed sandwiches, overflowing platters of smoked fish and mini sandwiches as well as other delicacies on the menu. Pay with cash, credit card, personal or corporate check, or your company account if you have a payment plan with Chutzpah. While at it, delivery fees will be determined by the distance. Your order gets to you in good time and exactly how you wanted it. Don’t stress over meals anymore when we have the capacity to deliver. There may be several restaurants that cater in Northern Virginia, but very few of them could beat the value you get from Chutzpah. Good place, very stacked Reubens. One complaint was that the pickles are inconsistent regarding freshness. Nice little place with slightly different food. Great food and service. Will definitely come back for more. Have Questions About Northern Virginia Catering?